Traditional Chinese medicine including Acupuncture offers reductions in pain and stress levels leading to improved health in a holistic, safe and natural way with no artificial drugs or chemicals. 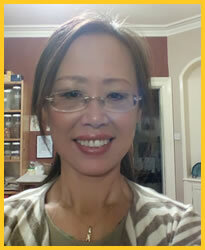 Chang Chun (Jenny) Ren is a highly qualified and experienced Practitioner with over 36 years of clinical experience in both hospitals and private practice. The Acupuncture Clinic welcomes you to a safe, friendly and professional environment, where you can discuss your concerns at a free, no obligation initial consultation and assessment. Changchun (Jenny) Ren, Doctor of Traditional Chinese Medicine (TCM) trained for 5 years at the University of Traditional Medicine at Beijing, studying both orthodox (western) medicine and traditional Chinese medicine and then worked for 17 years at Chong Wen TCM hospital in the city. During this time she treated many sports injuries as the hospital is situated near the National Centre for Sports, where China's Olympic and international athletes are trained. Having been a member of a team researching the use of acupuncture for pain relief and arthritis for 8 years, this is another area in which she has particular expertise. Jenny is also the author of a book about Women's Health which was in the top ten of China's bestseller list for many months, and for two years was the editor of a website answering queries about traditional Chinese medicine. She brought her skills to Scotland in 2002. Following 29 years extensive experience in both hospitals and private practice, Jenny opened The Acupuncture Clinic in Inverness in 2011. The practice is fully insured and licenced. We are sorry that Jenny's list at Inverness is now full, and regret that we are unable to accept any new patients at Inverness at the present time. Usually held on the first Sunday and Monday of the month, at Bee Bonnie, Main Street, Kyle of Lochalsh. Sadly we have had to discontinue the Clinic at Stornoway for the forseable future, due to pressure of work in Inverness and Kyle. In early 2015 after several years of extensive research, Jenny published another book in Chinese as a textbook aimed at medical professionals, and in June 2015 she was invited to speak at an International Conference on Acupuncture held at Irkutsk in Russia in conjunction with the World Health Organisation.